While I compile stories to write from my trip back home to Hawaii, I wanted to share my granola breakfast cereal that I make for my husband (aka crab accomplice) since it’s been a little while since my last post. As some of you may remember in the previous post “Funny Husband”, me and my husband were brought up very differently and what we eat for breakfast is definitely one of our differences. I like cereal as a snack (either w/milk or dry) but my husband eats cereal just about every morning. Buying a lot of cereal can get expensive if it’s not on sale – Hawaii in particular has some of the highest cereal prices in the US. In Australia, with the drought affecting so many farmers and the rise in petrol prices, food costs are also on the rise. Price is not the only reason why I decided to create this cereal – the main reason is so that I know what ingredients go into making it and that I can control the quality of the ingredients and alter the contents on a whim without buying numerous boxes. I honestly feel that the extra stuff I put into my granola makes it much more nutritious than the pre-made store-bought kind. 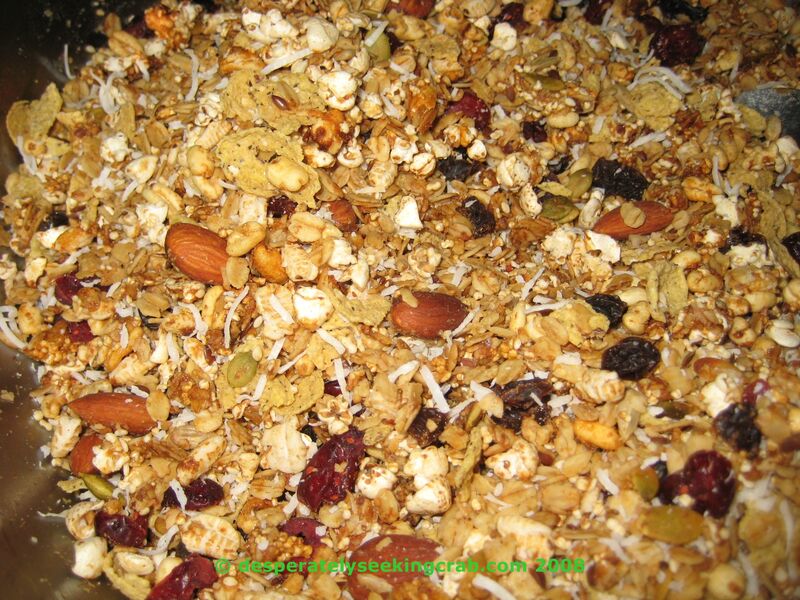 Dried fruit of choice – I use raisins, cranberries, blueberries, apricots, dates and shredded coconut. **You may just leave this raw and eat it like traditional European Müesli (omitting the oil, honey and tahini) but if you want it like crunchy granola, follow the directions below. Preheat oven to 325F / 160C. Combine all dried ingredients EXCEPT the fruit and mix through. Pour the oil, tahini and honey evenly over the dry mixture and use your hands (get dirty!) to evenly distribute and coat the sticky liquid throughout the dry ingredients. It is important that there are no lumps of honey or tahini left or else it may burn in the oven quite easily. Spread the mixture on two baking sheets and place in the oven. After about 10 minutes, take the trays out and stir the granola so that the browned edges get mixed into the middle to even out the browning. When putting trays back into the oven, rotate what rack you return the trays back onto (so if one was on the top rack, return it onto the bottom rack for the next 10 min). It takes about 20 minutes or so for the granola to become golden brown. Make sure you do not stray too far from it because it can burn quite easily (sort of like caramel does). Once golden brown, remove from oven to cool. Once cooled, add your dried fruit and/or coconut and corn or wheat flakes for added texture. Place in sealed plastic containers. **LSA – It’s a mixture that is used commonly in Australia that consists of linseed (flaxseed), sunflower seeds and almonds ground together. The usual way to make LSA is with a 3/2/1 formula – 3 parts linseed, 2 parts sunflower and 1 part almond. For example, approximately 100 g. linseed, 70 g. sunflower, 35 g. almond. Put mixture through a food processor until ground finely. Linseed is a good source of omega-3 fatty acids and cannot be absorbed by your body unless it is ground up. If eaten whole, the outer husk is so thick that it will simple just pass through you. I like using organic oats and tahini and whatever else I can find that is organic but that is entirely up to your budget or availability. If you don’t like tahini, use peanut, cashew or almond butters. Macadamia nut oil is my favourite for flavour and because it is good for you but you are welcome to try hazelnut, walnut, plain canola, or other oils that will impart a mild or nutty flavour. Amaranth may be hard to get for some but I like to add it for extra protein. You may substitute brown sugar for honey but I think honey gives it an extra complexity (try to buy local honey if possible). Try to experiment with different flavours and nuts and fruits. You can even split the granola batch in half and add different fruits to each half at the end to suit different people in the family. P.S. I actually ended up burning my batch of granola as I was writing this. My kitchen is pretty far from my office so I couldn’t smell it! I have made this a million times but because I wasn’t paying full attention to what I was doing, it burned! A good breakfast Italian lengthens life.